Monday February 26th 1923 I put in the forenoon up stairs wrote to Jake Ware, Gertrude Smith, Birdie and check to Mrs Folk that pays my board till March 9th. Went to town in afternoon. I was at Pickens awhile and with Mrs. Mitchel till time to come home. 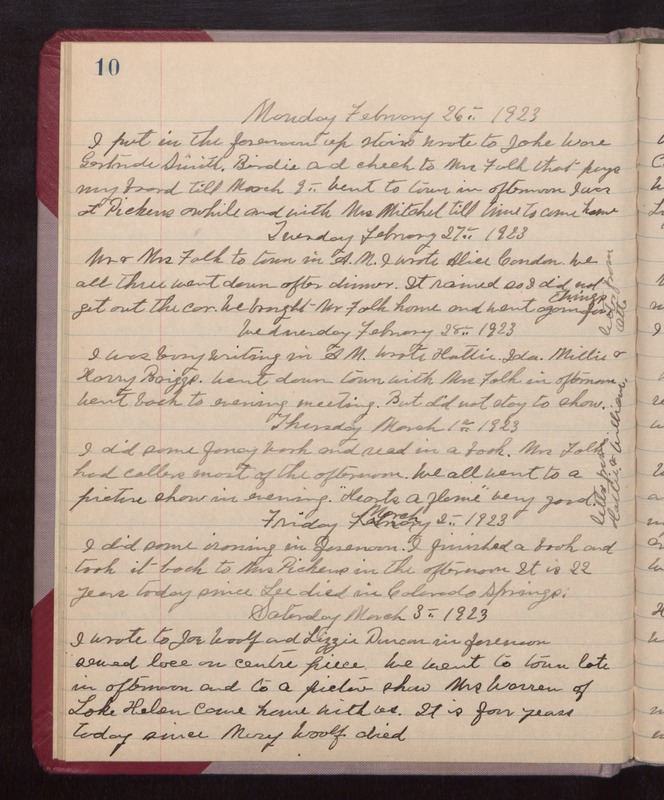 Tuesday February 27th 1923 Mr. & Mrs. Falk to town in AM. I wrote Alice Condon. We all three went down after dinner. It rained so I did not get out the car. We brought Mr. Falk home and went again for things. Letter from Ott. Wednesday February 28th 1923 I was busy writing in AM. Wrote Hattie, Ida, Mille & Harry Briggs. Went down town with Mrs. Falk in afternoon. Went back to evening meeting. But did not stay to show. Thursday March 1st 1923 I did some fancy work and read in a book. Mrs. Falk had callers most of the afternoon. We all went to a picture show in evening, "Hearts A Flame" very good. Letter from Hattie & William. Friday March 2nd 1923. I did some ironing in forenoon. I finished a book and took it back to Mrs. Pickens in the afternoon. It is 22 years today since Lee died in Colorado Springs. Saturday March 3rd 1923 I wrote to Joe Woolf and Lizzie Duncan in forenoon sewed lace on centre piece We went to town late in afternoon and to a picture show. Mrs. Warren of Lake Helen came home with us. It is four years today since Mary Woolf died.